Focaccia is something we have always had mixed feelings about. A lot of the focaccia we have had is kind of salty and crispy, almost like a cracker but thicker and more chewy (and more often then not, bland or way too herby). But then again, we had never had it homemade before, and 95% of the time, homemade is better. This is one of those times! 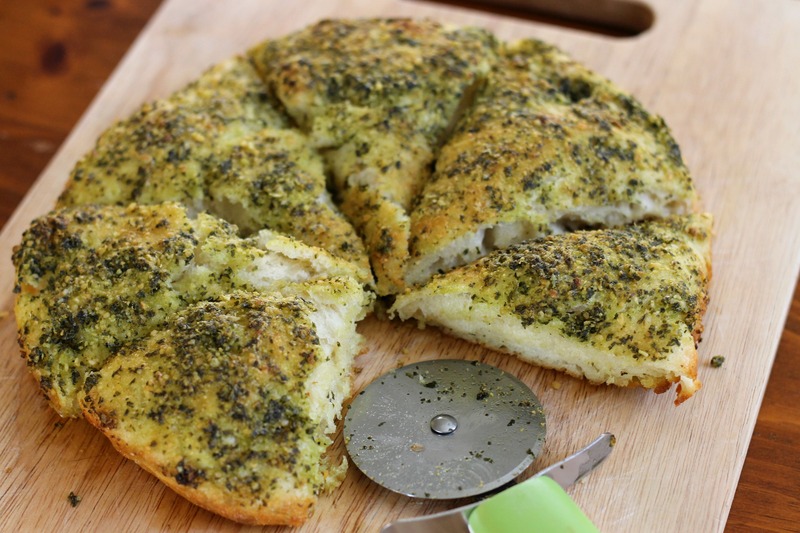 It’s reminiscent of a bread stick/pizza dough, but with a crunchy edge and flavorful pesto topping. We added a little grated Parmesan cheese to the dough, which, while adding flavor, ended up sticking to the pan. We were able to successfully remove the fococcia without breaking it, but for ease in the future we will be using a layer of parchment paper below the dough and recommend that you do the same. Combine flour, water, and yest in a large bowl and stir until a uniform mass forms and no dry flour remains. Cover bowl tightly with plastic wrap and let stand at room temperature for 8-24 hours (after this, store in the fridge for up to 3 days if not using immediately. Allow to stand at room temperature for 30 minutes before proceeding), then use immediately. Stir remaining flour, water, and yeast into the sponge with a wooden spoon until a uniform mass forms and no dry flour remains. Cover with plastic wrap and let rise at room temperature for 15 minutes. Sprinkle 2 teaspoons salt and the 1/2 cup Parmesan cheese over the dough and stir in until fully incorporated. Cover with plastic wrap and let rise for 30 minutes. Spray rubber spatula with vegetable oil spray. Fold partially risen dough over itself by gently lifting and folding edge of dough toward middle. Turn bowl 90 degrees and fold again. Turn bowl and fold dough 6 more times for a total of 8 folds. Cover and let rise for 30 minutes. Repeat this process 2 more times. 1 hour before baking, place a baking stone on the middle or upper rack. Preheat the oven to 500 degrees. While the dough rises, place unpeeled garlic in a small pan. Toast over medium heat until skin has browned slightly and the garlic has softened. Remove from heat. In a food processor, combine garlic, basil, olive oil, and salt. Pulse until basil is mostly chopped. Add Parmesan cheese and pulse until the mixture is mostly smooth. Pour into a bowl and set aside. Transfer dough to a lightly floured counter. Dust the top of the dough with flour and divide it in half. Shape each piece of dough into a 5-inch round. Place a parchment paper round in two 9-inch round cake pans and coat with 2 tablespoons olive oil each. Sprinkle each pan lightly with salt. Place each piece of dough into a pan and turn to coat with oil. Cover pans with plastic wrap and let rest for 5 minutes. Using fingertips, press dough out toward the edges of the pan. Using a fork, poke surface of dough 25-30 times to pop air bubbles. Brush half of the pesto topping over each dough round. Let dough rest in pans for 5-10 minutes. Place pans on baking stone and lower oven temperature to 450 degrees. Bake until tops are golden brown, about 20-25 minutes. Transfer pans to a cooling rack and allow to cool for 5 minutes. 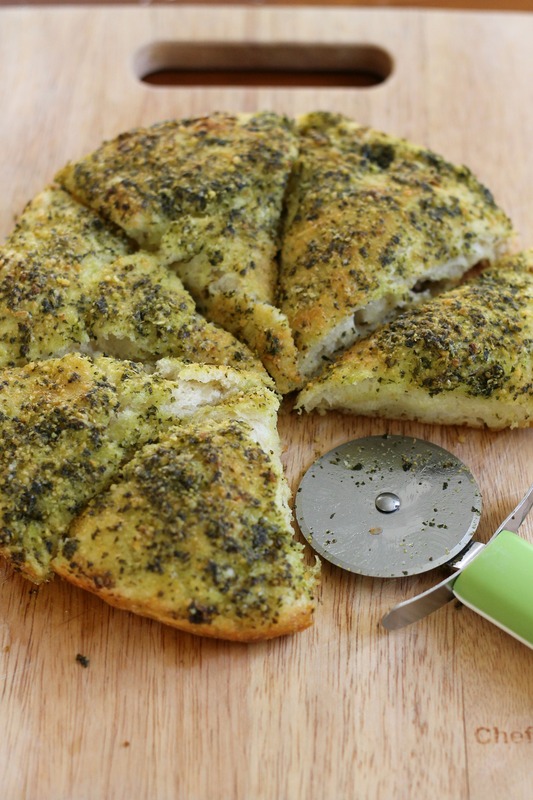 Remove focaccia from pans. Let cool for 30 minutes, then slice into wedges. Enjoy!